I've very recently returned from a week away in Tenerife and luckily the holiday blues are still yet to set in.. maybe when I return to work! If I'm honest, Tenerife wasn't my first choice when booking this holiday. It was a last minute deal with Thomas Cook (a real last minute, I'm talking 3 days prior!). The holiday was mainly to chill out and relax and take things easy, and this we definitely did! I loved knowing we never had to get up early for something (as like my last 2 main holidays in Florida & Vegas!). Everything was really laid back but I really enjoyed the change of scenery. We stayed at the 'Best Semiramis' Spa Hotel in Puerto De La Cruz. This is meant to be a 5* hotel (although I'd rate it a little lower). Either way, we were told that this was once the best hotel in the area up until a couple of years ago when another one was built. Ours then took second place.. it was nice knowing we were staying in a bit of luxury though! Clockwise from top left - View from balcony. Cute little house (can I live here please?). Sunset. Waffle and icecream! Staying on a B&B basis, most days were spent strolling down for breakfast at 9.30ish, and having a huge array of breakfast foods to choose from. To save money, we made sure we stocked our bellies up on food with the hope that it'd see us through till tea time! Most days it did, with maybe a naughty mid-afternoon snack from the shop in between! After this we'd spend an hour or 2 on the internet in the lobby overlooking the sea (there was no wi-fi in the rooms, how annoying!). I know using the internet on holiday is controversial, but it gave me the time to do things I like, usually time that I haven't got back home. Then we'd walk up the road, taking a slow stroll round the shops, maybe stopping off for a drink in a quiet café. We'd then come back to the hotel room and play games on the balcony (the view was to die for!). At tea time we'd take a stroll into the centre where we'd find more restaurants, stopping off for tea at one of them. After tea we'd take a stroll round all the shops (there's something about shopping in the evening that I really love!). Occasionally we'd find a bench overlooking the beach and just people watch as the sun set. One of the days we went to Loro Parque which is a huge animal park with dolphin/sea lion shows etc. Its rated as the No1 attraction in Tenerife so we were lucky to be so close to it. It didn't disappoint but I'll keep that for another post. 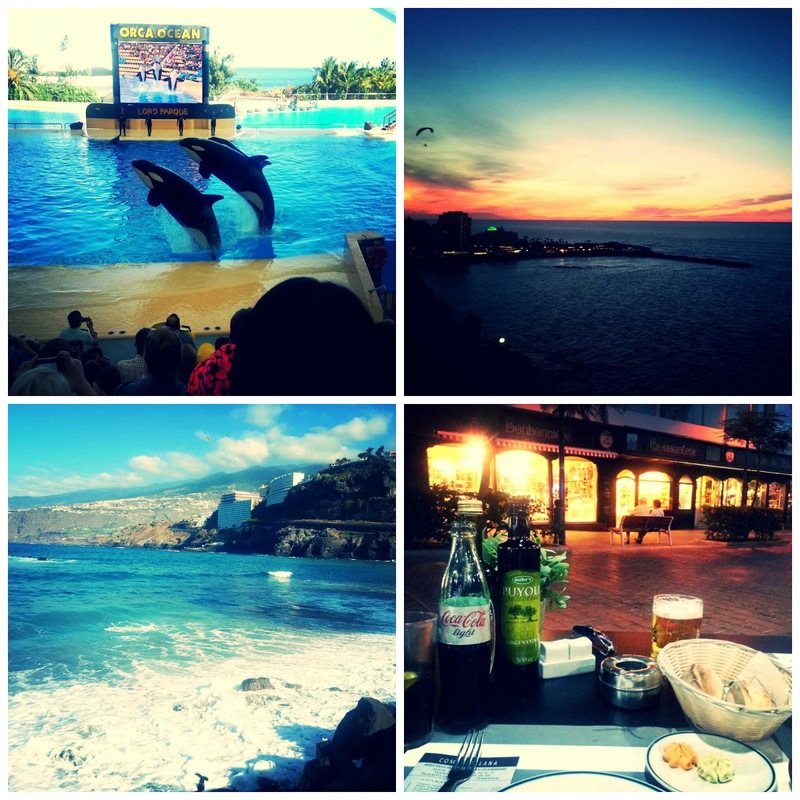 Clockwise from Top Left - Loro Parque Orca Show, Sunset, Street Side Italian Restaurant, Beach. All in all, although we never did much, I kinda liked the laidback feel of not feeling rushed and committed to doing anything. 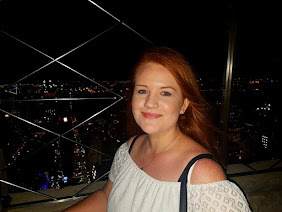 I've returned feeling really refreshed from it, and for once in a long time, I've returned from a holiday not feeling shattered and in need of constant sleep (it did help that there was no time difference too!). Have you been on any relaxing breaks recently? 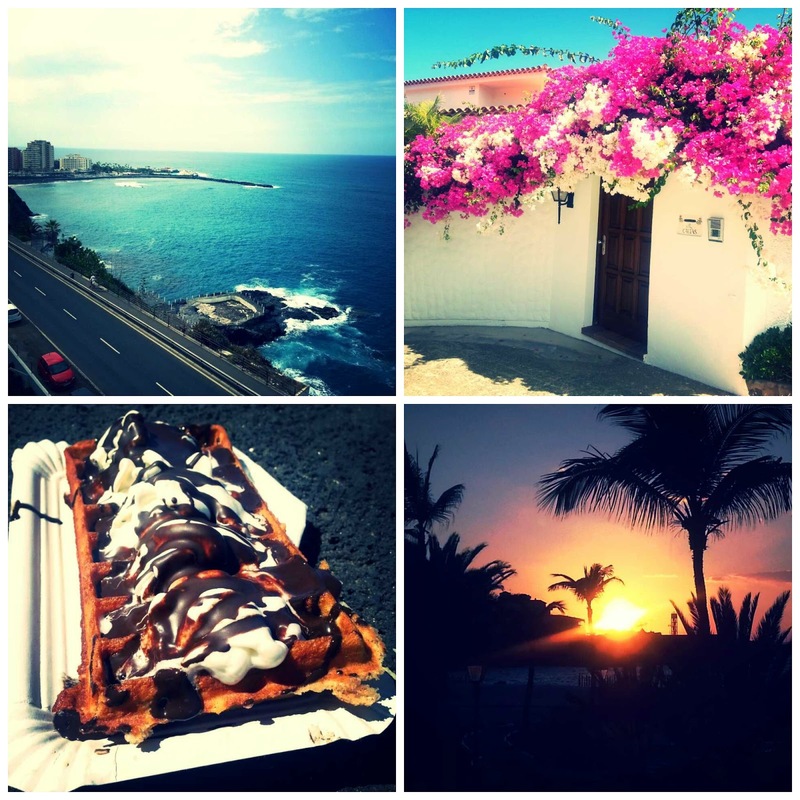 Gorgeous pictures :) I've always wanted to visit Tenerife, that waffle looks to die for!